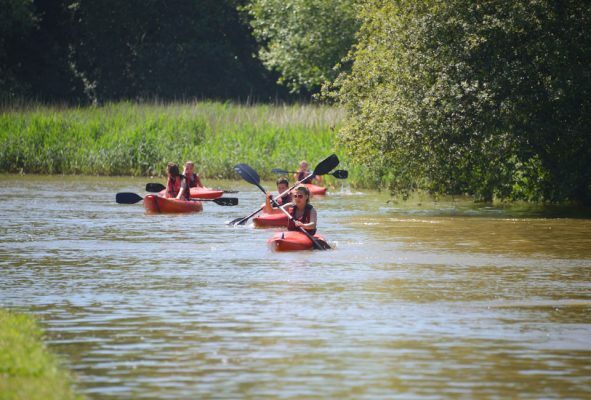 We love nothing more than kayaking, and anyone joining us on a family activity holiday, primary school residential trip or a group activity day will have the chance to give the sport a go. Kayaking is a great way of relieving the day-to-day stress that you may be experiencing, whilst also offering a chance to enjoy beautiful and peaceful surroundings when out on the water. Kayaking is a great, full body workout which is excellent for burning calories and helping you to tone up. An average hour-long kayaking session can burn up to 300 calories, and that’s just from paddling about! If you add in some speed racing against your friends and family, this helps to kick the cardio intensity up a notch. As for toning, your arms and core will benefit from the range of motions required when paddling, which will help to give you a more toned appearance overall. What better way to spend time enjoying the beauty of nature than doing it with your friends and family? Heading out in kayaks in a group is a great way to bond and share new experiences. We also mentioned above that you can race with your friends to help get a better workout, but it also gives bragging rights to the winner! Once you have mastered the basics of kayaking (which we will teach you at our centre) you can head out and embrace your own sense of adventure, either at home or abroad on holiday. There are many locations around the world which cannot be accessed by land, so if you are able to paddle in your kayak it will allow to you explore these beautiful locations at your leisure. We’ve mentioned that kayaking can help you relax and unwind, but a 2008 study also suggests that it may benefit people who have suffered intense physical injuries. During the study at Karolinska Institutet in Sweden, patients who had suffered from spinal cord injury were put on a kayak training programme for 10 weeks. At the end of it, those patients had managed to improve their balance control that was affected by the injury, proving that kayaking can aid in rehabilitation. Kayaking is often overlooked when it comes to outdoor activities, but we think it’s one of the most enjoyable sports out there, whilst also having a lot of positive effects on your life and wellbeing. Why not pay our centre a visit and give it a go for yourself?